Our Miasmatic Reactor Core Steampunk Cufflinks are actually atmospheric purifying and energy extraction devices, designed to defend against the hazard of noxious air, as well as fine accents to your attire. 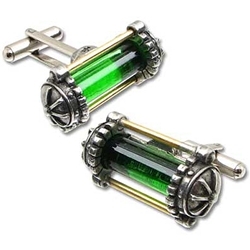 Made from quality pewter, these steampunk cufflinks have the clear look of a technological electrolysis chamber, filled to the brim with an odd green chemical. No doubt, electrolysis and this green substance are what aid in the process of extracting energy and impurities out of the air. The Miasmatic Reactor Core Steampunk Cufflinks is an excellent item to add flair and character to any formal wear, as well as a superb gift idea for a gentleman with an esoteric touch of class.